Source: U.S. Energy Information Administration, Bentek Energy LLC. Natural gas liquids (NGLs) are hydrocarbons—in the same family of molecules as natural gas and crude oil, composed exclusively of carbon and hydrogen. 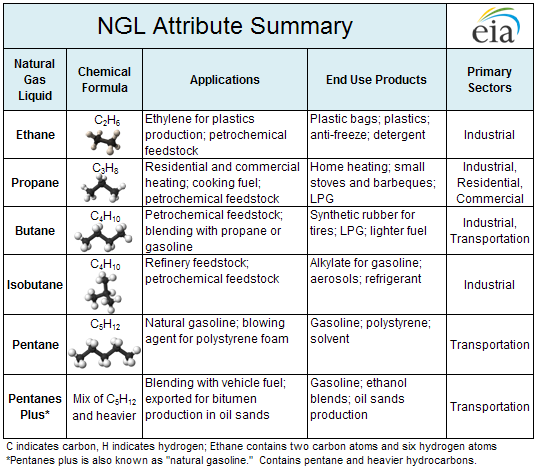 Ethane, propane, butane, isobutane, and pentane are all NGLs (see table above). There are many uses for NGLs, spanning nearly all sectors of the economy. NGLs are used as inputs for petrochemical plants, burned for space heat and cooking, and blended into vehicle fuel. Higher crude oil prices have contributed to increased NGL prices and, in turn, provided incentives to drill in liquids-rich resources with significant NGL content. The chemical composition of these hydrocarbons is similar, yet their applications vary widely. Ethane occupies the largest share of NGL field production. It is used almost exclusively to produce ethylene, which is then turned into plastics. Much of the propane, by contrast, is burned for heating, although a substantial amount is used as petrochemical feedstock. A blend of propane and butane, sometimes referred to as "autogas," is a popular fuel in some parts of Europe, Turkey, and Australia. Natural gasoline (pentanes plus) can be blended into various kinds of fuel for combustion engines, and is useful in energy recovery from wells and oil sands. Oil and natural gas producers are increasingly targeting liquids-rich parts of supply basins due to higher crude oil prices, which influence the value of NGLs. NGL field production is growing in the United States, representing an important part of the supply picture. NGLs are extracted from the natural gas production stream in natural gas processing plants. Current elevated levels of domestic oil and gas development have pushed NGL production to an all-time high (see chart), leading to concerns over processing and distribution constraints in the coming years. Source: U.S. Energy Information Administration Form EIA-816, Form EIA-914, Petroleum Supply Monthly. Notes: Natural gas converted to barrels of oil equivalent using a conversion factor of .0007161 barrels of oil per cubic foot of natural gas. Conversion factor from the Society of Petroleum Engineers.